Fazer Mill & Mixes has invested in a new oat mill in Lahti, Finland. The mill has now been in operation since the summer 2013 and is one of the most modern oat mills in the world. Fazer wants to respond to the increasing demand of oats in the world by offering excellent Finnish oats. Fazer Mill & Mixes is already renowned for its high-quality rye and wheat products. ”A lot of untreated oat is exported from Finland, but we at Fazer want to add value to the oats and export ready- made products which require good professional skills” says the Director of Fazer Mill & Mixes Pekka Mäki-Reinikka. Finland is well known as a producer of the highest quality oats. Finland also has a lot of organic farming with 9% of the arable field area certified organic with a growth of 11% per year (2012). The most popular grain in organic production in Finland is oats because it adapts well to organic farming in Nordic conditions and gives consistent high quality yields. Finland is globally one of the biggest producers of organic oats. Finland’s official target to reach 20% organic field area by 2020 gives confidence that sufficient raw-material will be available. 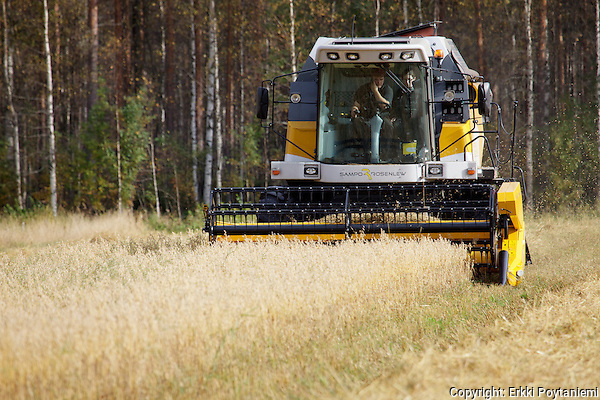 Fazer is one of the biggest millers of organic grain in Finland. Fazer’s goal is that a significant part of the new oat mill’s production will be certified organic for export markets. With this in mind Fazer has decided to enter into cooperation with Organic Food Finland who has a long experience in export of organic products and knows well the organic grain market and specifically the oats market. Erkki Pöytäniemi at Organic Food Finland will use his wide contact network and market knowledge to develop the export. Fazer Mill & Mixes will be exhibiting at BioFach 2014 in Nuremberg, Germany in February 2014. ”I am excited that we can offer high-quality Finnish organic oat flakes to the growing organic market in Europe and elsewhere. This is a win-win for the Finnish organic farmers, Fazer and the increasing number of demanding customers and consumers around the world.” Erkki Pöytäniemi says. Oat flakes and other oat products now available from Fazer Mill & Mixes. Fazer Mill & Mixes has started a brand new Oat Mill with state-of-the-art technology in Finland in September 2013. Fazer’s oat mill represents the very latest production technology which allows us to create a wide range of high quality products. The new oat mill enables us to complement our product range with oat products but also rye and wheat flakes. Our portfolio is primarily intended for bakeries and the food industry including oat flakes with different technical properties as well as stabilized kernels and steel cut oats. As raw material we use only Finnish oats which is available also in organically-grown. The package sizes are 10 or 20 kg paper bags and big bags (500 – 1000 kg). Fazer is an international family-owned company offering bakery, confectionery and biscuit products as well as contract catering, restaurant and café services. Fazer operates in eight countries and exports to more than 40 countries. The company’s success, ever since its establishment in 1891, has been based on the best product and service quality, beloved brands and skillful people. Fazer’s operations comply with ethical principles that are based on the Group’s values and the UN Global Compact. The company operates in two business areas. Among Fazer Brands’ well-known delicacies are tasty baked goods and confectionery. Fazer Food Services offers good food and tailor-made services in contract catering. Fazer Group’s net sales in 2012 amounted to nearly 1.7 billion euros and the company has over 15,000 employees. Fazer Mill & Mixes was created in 1971 on Sven Fazer’s initiative to secure the supply of flour of high quality and competitive price for Fazer’s bakeries. First, the mill delivered flour only to Fazer’s own production units, but in 1990 Fazer Mill & Mixes started sales to external customers as well as exports. This provided the mill a strong impetus for growth and since 2008 Fazer Mill & Mixes has been the largest commercial mill in Finland and the second largest one in the Nordic countries, milling wheat and rye flour. The production of special mixes started in the 1990s and in 2003, the previous major investment was made in a new mixing plant. Fazer Mill & Mixes has grown into the biggest producer of special grain mixes (bakery mixes) in Northern Europe. Some 15 per cent of the production of Fazer Mill & Mixes is exported. The annual milling quantities of wheat are around 100,000 tons and of rye, slightly over 50,000 tons.